Opis 3: over 300 books from Stalin’s personal library with his marginal notes. Opis 4: Stalin’s biographical materials. Opis 11: Stalin’s correspondence and documents. This Opis covers a period from 1917 to 1952. 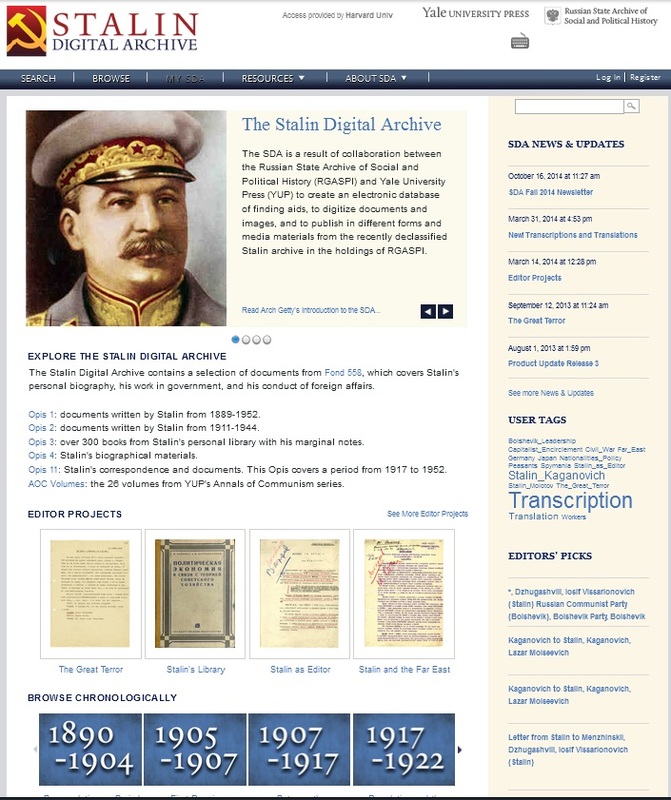 The Stalin Digital Archive is a result of collaboration between the Russian State Archive of Social and Political History (RGASPI) and Yale University Press (YUP) to create an electronic database of finding aids, to digitize documents and images, and to publish in different forms and media materials from the recently declassified Stalin archive in the holdings of RGASPI. Digital versions of Yale’s Annals of Communism series supplement the RGASPI collection with additional scholarly commentary on selected documents concerning the history of Soviet and international communism from Russian state archives spanning the 75-year history of the USSR.